Since Greg Koch and Steve Wagner founded it in 1996, Stone Brewing Co. has been producing an ever-expanding line up of well crafted and often in-your-face beers and interesting collaborations. Stone’s gargoyle mascot watches over each of these beers, attempting to draw in their ideal consumer and to scare off the Keystone-swilling undergrad that stumbled into the display. Don’t let it intimidate you. 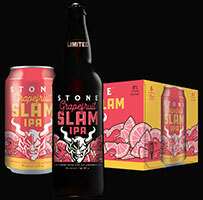 Known for its bold, flavorful and largely hop-centric beers, Stone has earned a reputation for brewing outstanding, unique beers while maintaining an unwavering commitment to sustainability, business ethics, philanthropy and the art of brewing. Today, Peaks and Pints presents Craft Beer Crosscut 2.7.19: A Flight of Stone Brewing Co., a five craft beer sample flight of the Southern California brewery’s talent. Two years ago, Stone Brewing Co. added Fyodor Imperial Russian Stout to its Small Batch Series. Named after the influential Russian novelist, Fyodor Dostoyevsky, this rich version of the brewery’s Totalitarian Imperial Russian Stout marches to 13.5 percent ABV, brewed with warrior hops before being aged in both Kentucky bourbon barrels for seven months. This profoundly complex beer overwhelms all but the most stalwart beer fanatics with its level of intensity. It hits the nose with bourbon, oak, charred malts, dark fruits, figs, and a warming alcohol burn. Rich coffee bean bitterness and milk chocolate characteristics abound, while dark charred oak, rich vanilla, and caramel from the bourbon barrels synergistically elevate and further enhance the ultra-intense taste of the original stout. It hits all the right notes. Stone Brewing hosts the American Homebrewers Association Rally — a people’s choice-style homebrew competition at their annual AHA Rally in Southern California. During the Rally, attendees have the opportunity to sample beer from dozens of homebrewers and vote on their favorites. The winning homebrewer’s recipe is replicated by Stone on a commercial scale, distributed around the country, and entered into the annual Great American Beer Festival Pro-Am Competition. 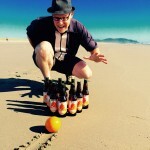 In 2014, San Diego homebrewer Chris Banker won with what would eventually be named Xocoveza for the Holidays and New Year. The inspiration came from Mexican hot chocolate combined with coffee. This imperial mocha stout is brewed with coffee, pasilla peppers, vanilla, cinnamon, nutmeg and a generous amount of Stone’s in-house made chocolate. According to Stone Brewing hype, Tropic of Thunder Lager is just right for a self-imposed “three-hour tour,” be it on an island, on a boat, or simply on the couch. Aromas of citrus, pineapple, and coconut are followed by flavors of lime, orange and passionfruit — plus, thanks to Cashmere hops, flavors of ripe cantaloupe that elevate the juicy qualities of this lager. Light on the palate, this lager brings the hops and fruit. They don’t brew in Pasadena. 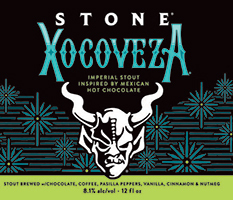 Stone Brewing Co. is headquartered in Escondido, and they brew in San Diego, Richmond VA, and in Berlin, Germany. But, Stone’s small Pasadena hideout pours all of their beer and does growler fills, bottle sales, merchandise and keg rentals. AND, Stone Brewing began as the collaboration of beer lover/homebrewer Steve Wagner (Stone’s President and original brewmaster) and beer geek/rock and roll entrepreneur Greg Koch (Stone’s executive chairman) after a mutual friend introduced the two in Los Angeles in 1989 when they were both working in the music business. In fall of 2014 Stone created a draft-only version of delicious Grapefruit Slam double India pale ale. Its bitter, zesty grapefruit peel infusion created a bright accent to flavors of pine resin and fresh citrus well in advance of the explosion of fruited beers we’re all reveling in at the moment. They never stopped thinking about it, so a long five years later — it’s back for round two. 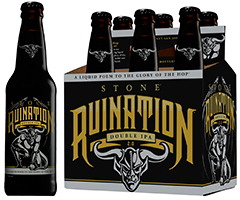 Filling our last taster glass is Stone Brewing’s Ruination 2.0, a craft beer that pours a dark gold, just on the edge of orange. The aroma is immediately super dank and resinous, piney, just West Coast classic turned up to 11, before giving way to grapefruit and orange fruit notes and grass. This beer wears its 100+ IBUs, with Magnum and Nugget hops providing a hefty dose of standout bitterness. Citra, Simcoe and Azacca hops provide the bountiful tropical fruit and resinous pine aromas. Combined, the rich tapestry of hops results in a taste profile rife with citrus, melon and tropical fruit flavors.